This Whimsical Sashay Cowl was designed for the Holiday Stashdown CAL 2015 – a Crochet-a-Long curated to help everyone complete some quick and cute last minute gifts using yarn out of their stash. Great idea! This is just one of the 15 designs so make sure you stop by to check it out and be inspired! Keep in mind, the regular Sashay yarn used (in Jive) has 5 yards less than the Sashay Sparkle. This is why is was used in the center of my cowl, as I wouldn’t have had any extra to add on anywhere else. Though not tested yet, I think any Super Bulky Yarn would work great for this project (or 3-4 strands of worsted weight yarn held together). Number One on my list to try is Hometown USA. I was able to work up this cowl and get my pesky ends weaved in in just under an hour. R2 – R6: Chain 1, turn. SC in the 2nd stitch, and each stitch across. Join to the first stitch of the round, not beginning chain. Change yarn colors in the last yarn over of the last stitch. Use the hook to reach through the stitches to bring the old color through to the wrong side, and work over yarn tails. 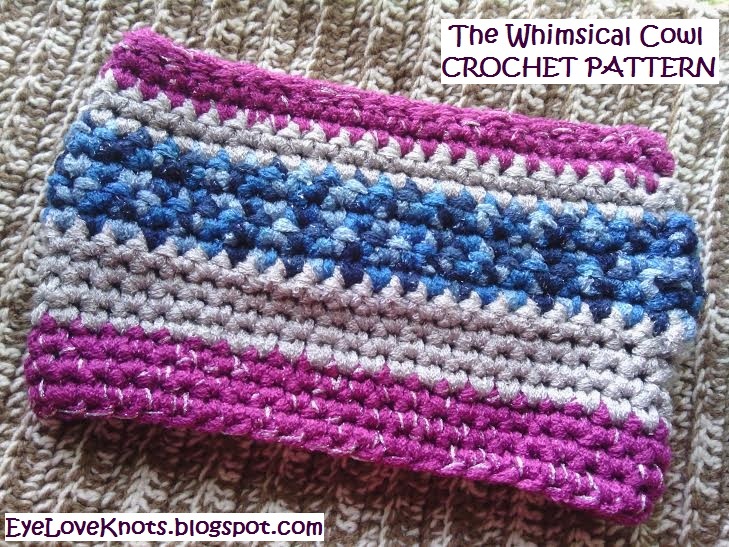 For assistance, see my How to Change Colors in Crochet the EyeLoveKnots Way post. I worked my final join as an invisible join – you can find a photo tutorial of this process in my Newborn Twin Chunky Hat post. Weaving in your ends (two including the beginning and end), will be a challenge. I found with the track-like pattern of the sashay yarn that I had to thread each one separately into my tapestry needle. The weaving in process also requires patience as you must weave in underneath the whole stitch, and not just part of the stitch or the needle will get stuck and you could risk pulling one of the track-like pieces from within the stitch. I usually use a small hook when using super bulky yarn to help weave my ends in – you may want to try this technique instead. R2 – 4: Chain 1, turn. SC in the 1st SC, and in each SC across. Join with Gray. R5 – 8: With Gray: Chain 1, turn. SC in the 1st SC, and in each SC across. Join with Blue. R9 – 12: With Blue: Chain 1, turn. SC in the 1st SC, and in each SC across. Join with Gray. R13 – 14: With Gray: Chain 1, turn. SC in the 1st SC, and in each SC across. Join with Pink. R15 – 16: With Pink: Chain 1, turn. SC in the 1st SC, and in each SC across. Join. R17: Chain 1, turn. Slip stitch in each SC across. Join – I did so here with an Invisible Join. Please feel free to make and sell your own Whimsical Sashay Cowls using this pattern, but please DO NOT claim this pattern as your own nor should you sell my pattern, and DO NOT re-publish my photos as your own. DO NOT copy and paste my pattern anywhere, link to it instead. 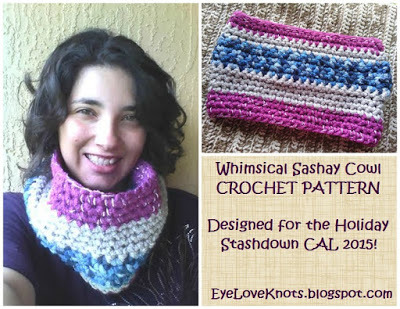 or EyeLoveKnots Craftsy – Whimsical Sashay Cowl. **Share your version of this Whimsical Sashay Cowl on Ravelry! Check out the EyeLoveKnots Ravelry page to keep track of all your EyeLoveKnots favorites in your que, and share your WIPS and finished projects! Don’t Crochet but Interested Purchasing a Whimsical Sashay Cowl? You can check out EyeLoveKnots on Etsy to see what I have available! Use the search box to type in what you have in mind, such as “Cowl”, “Scarf”, “Sashay” etc. Also feel free to send me a message on Etsy, or email with your custom request. View Color Options Here: Sashay Original, Sashay Sparkle also available in Sashay Metallic, Sashay Boho, Sashay Team Spirit, Sashay Sequins. Yarn Fanatic Party #52 cont’d – Happy Friday! Yarn Fanatic Party #53 – Happy November! So cute…you have some serious skills!